This painting epitomizes my very favorite thing about painting a commission: I literally get to paint scenes from all over the world! 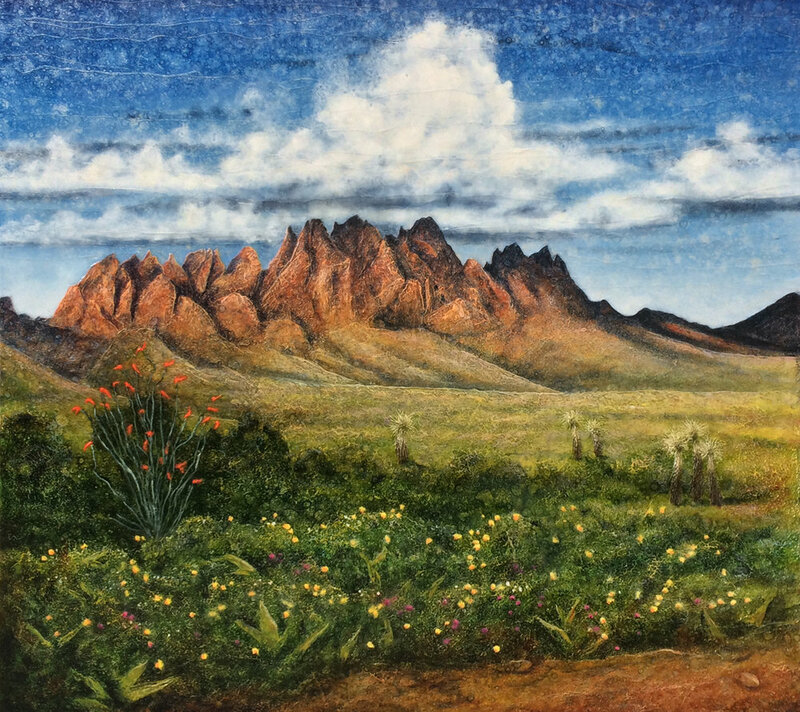 This just completed piece "The Organ Mountains" is depicting a mountain range just east of Las Cruces, New Mexico. They were named the "organ" mountains because the jagged peaks reminded early settlers of a pipe organ (so the story goes). Planning for this painting began last December when a very nice local couple were visiting my art studio in Asheville's River Arts District. They liked my technique and asked if I ever did commission work. I love that question. I explained that "YES!" I do commissions and that they comprise over half of all I paint at this point. So they pulled out their iPhone and showed me photos of these incredible desert mountains and I was totally hooked. After agreeing to the size, they sent me several photos they liked, which I kind of combined together, i.e. I took the composition of the mountain range in one of the photos and sketched my composition based on that photo. But it was dark and the coloring was off, so I used the lighting and coloring of a second painting and vegetation from a third photo. After I completed the sketch, texturized it and applied the metallic leaf, I colorized it with multiple layers of oil paint and called in my clients to take a look. They asked if I could insert a massive cumulus cloud above the mountains, and insert an ocotillo plant and some yucca's (all cacti indigenous to that region). A week later, I completed the painting, applied the gold to the edges and poured the resin. I love the American South West. I've spent a lot of time exploring the area but it's so, SO vast, there's no way anyone could see it all in a lifetime. If you like very wide open spaces and dramatic geology, the west is definitely worth a visit (and definitely worth commissioning a painting I might add). "Autumn Afternoon at the Biltmore"
"Autumn Afternoon at the Biltmore" began with a request from a local couple back in December. They were visiting my Asheville art studio and gallery and it turns out they have season passes to the Biltmore Estate and were describing a scene which featured the narrow road between the reflection pond and the French Broad River. After agreeing on the size and price, they went back to the Biltmore and took photos which became the basis for this piece. This was a challenging piece in that the composition is not just based on one photo but five. For instance, the boat in the foreground was in a separate photo and the sun burst in the trees was in another photo. The actual roadway has vegetation on the side of the river that pretty much blocks the view of the water so...for this painting, we did a bit of judicious weeding. At the very last minute, Canada geese were added into the reflection pond at the request of my clients and since I have a soft spot in my heart for ducks and geese, I added them happily. Honestly, what I am describing is one of the most important aspects of a commission: I'm not just painting a scene, but assembling a composition based on five photos which encapsulated all the warm memories this couple has of days of wandering and hiking around the Biltmore Estate. The result (I hope) is not just a nice painting but something sentimental. I painted memories in this one and had a great time doing it and the fact that the Biltmore Estate is the subject matter made it even better. The first year Joy and I moved to Asheville, we purchased season passes to the Biltmore as well. It's a great way to really enjoy not just the amazing house but the grounds as well. There are literally miles of trails to hike and several gardens to explore such as the formal and informal gardens designed by the amazing landscape architect Frederick Law Olmsted. If you have the chance to visit Asheville, North Carolina, it's definitely worth saving your pennies to visit. And...if you end up taking an awesome photo during your visit, send it my way!